FREE or DISCOUNTED BOOK OF THE DAY + Bonus Drawings (at bottom)! Fill out the form to get The Baron's Heart for FREE! The Baron of Ravenford has been assassinated--brutally murdered in the dead of night. Even more gruesome, his heart was stolen. With the body magically preserved, there's only a short window of time to find it and resurrect him. Once again, it's up to the young heroes to set things right. Who murdered Gryswold and why? Where did they take his heart? Was it an act of jealousy or is there a more sinister motive behind it all? On top of that, why are people suddenly disappearing from town? Does it have anything to do with rumors of a Dunwynn occupation? Are there darker forces at work? 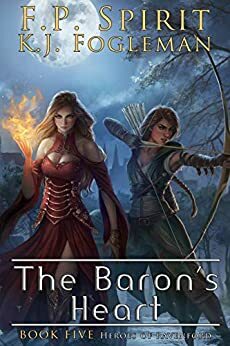 From the underside of Vermoorden to the catacombs beneath Ravenford itself, the heroes face lethal assassins, creatures of the night, and an imminent invasion. Can they protect Ravenford and still find the Baron's heart in time? Get "The Baron's Heart" Free! Free Book Consent I give my consent to have my email added to THIS author's newsletter list and the AuthorsXP.com website. This information will be used by the authors and AuthorsXP to send me newsletters featuring special offers and other information, from which I can unsubscribe.